Sarah Gilchrist has fled London and a troubled past to join the University of Edinburgh’s medical school in 1892, the first year it admits women. She is determined to become a doctor despite the misgivings of her family and society, but Sarah quickly finds plenty of barriers at school itself: professors who refuse to teach their new pupils, male students determined to force out their female counterparts, and—perhaps worst of all—her female peers who will do anything to avoid being associated with a fallen woman. 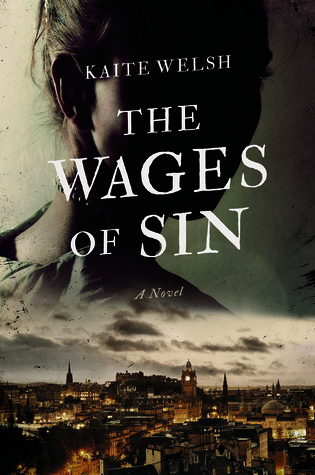 I came across the Wages of Sin some time ago and, intrigued by its setting and subject matter, put it on my long ‘to be read’ list. Then, a few weeks ago I was fortunate enough to hear author Kaite Welsh read from her book at a Noir at the Bar event in Edinburgh. I loved what I heard so much that I went home and started reading this book straight away – a decision I’m glad I made, since I absolutely adored this story. The setting for the story is 1890s Edinburgh, and Welsh does a masterful job of evoking the sights and smells of the ancient city, thick with slums, and contrasting this with the orderly and more privileged (but no less debauched) new town. As a piece of historical fiction this novel is superb, with Welsh firmly setting Sarah’s sleuthing tale in the context of the time, tackling issues from poverty and deprivation, to the social conflict surrounding female emancipation and sexuality with impressive sympathy and accuracy. At times it was hard not to feel as though I had been transported back to 1892! A highly enjoyable read – I am looking forward to the next installment in the series already. Five stars.